I actually just sent an email to Translink about the waste of paper and postage on that letter before cruising over here to your fine blog. Also, I complained about their incorrect grammar talking about Clipper Ship(s). For all those millions on marketing, they should get a little proofreading. Yeah I got the letter. I have not noticed any malfunctioning readers this week. Last night I was on the 38L outbound, when the proof of payment guys boarded the bus at Van Ness. They didn't even scan my Translink card. Maybe they've been told to disregard those with cards for now? 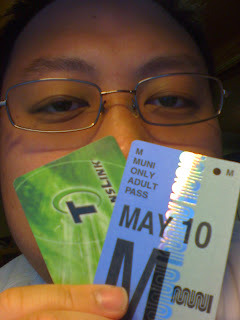 I'll keep using Translink on Muni for now. Yeah I got the letter too, it did seem wasteful. I wish they had used that money to mail replacement cards, I really like the new design. Yes, I was pretty shocked that they would send a letter about that. In fact, I can't recall if I've received any informational updates in the past (other than automated requests I'd made), but it boggles the mind why they'd send that full-color letter. On another note, Translink seems very reliable on AC Transit, which I understand was one of the first agencies to make an official transition. In my experience, it has worked at least 98% percent of the time. The readers at least look to be the same as MUNI readers. I don't think there were too many problems transitioning AC paper passes to Translink. Now if UC and AC would team up to put Cal students' passes on Translink like they are for faculty and staff, that would be much better than the little sticker on ID cards, to deter both fraud and theft.